1. Which Harmony models (and in your case, Valco and Danelectro models) do you own or have owned? - I've owned two Espanadas, both of which I bought in the late 80's. Both were the same model, full-bodied f-hole guitars painted black with aluminum (GH: Harmometal) binding and P90 type pickups (GH: P13 pickups made by Gibson). The first one had a Harmony logo on the headstock and a broken neck. I bought it from Löffe (Per-Olof Löfberg) who is a legendary finnish guitar collector and enthusiast. I sold it to a guy from Hyrylä whose name I don't remember at the moment. I heard that he had it repaired and that it turned out OK. The other one was branded Silvertone. I bought it from Antero Jakoila in 1990. He had to pay a substantial amount of back taxes so he sold me the guitar and his 1959 Fender "full power" Twin Amp. You can see both the guitar and the amp on the cover of Albert Järvinens album "Braindamage or Still Alive?" which was produced by Jakoila. - My interest in these guitars was inspired by Junior Watson, a guitarist from Los Angeles who was responsible for bringing the model back into the blues circles. Watson used to play a lot in Finland with Rod Piazza at the time and I was introduced to him by Löffe. Later I noticed that Dave Gonzales from The Paladins used an Espanada on their first album (at least he posed with one in pictures). I wired the pickups to get an out of phase sound which gave me a good T-Bone Walker tone, but I came to the conclusion that the Espanada was too heavy and cumbersome for my taste. I traded it for a Telecaster at Musiikki Fazer after owning it for a few years. It was bought by Jonne Kulluvaara who in turn sold it to Kari Johansson. The Espanadas sounded great for Jump Blues/Down Home blues stuff but the necks were like baseball bats and they were hard to play. - I also own a red Airline (made by Valco for Montgomery Ward) that I bought in 1986 at Kitarapaja. I've used it on gigs all these years. It's the same model that has become Jack White's (White Stripes) trademark guitar. I bought it inspired by Jimmy Reed and it's become one of my regular slide guitars. I love the hollow "nasal" sound that it produces. The "jet age" design with its two part resoglass body is cool. - My other main slide guitar is a Silvertone solidbody (alder) amp-in-case model with one lipstick pickup. I bought this one in 1985. The sound is great. There was a two-pickup model of this guitar which apparently used the same body, since it's actually routed for two PU's. It's a really ugly but brilliant guitar that has never let me down. It's put bread on my table for over twenty years which is why I call it my breadshovel (with respect). These were made as mail order guitars for the Sears & Roebuck catalogue. This model, which I think is from 1968, isn't nearly as common as the double cutaway particleboard-bodied older version. - I've also owned a white 3PU Supro "J.B. Hutto"-model, a Supro Sahara, a National Westwood and two Supro Dual-Tones. Fun guitars, but sold due to lack of use. You can't keep them all. I try to limit my guitar arsenal to stuff that I use regularly. 2. What attracts you to older Harmony (&Valco, Danelectro) type guitars? - Their unique sound that you just can't get out of a Gibson or a Fender. Many blues guys used cheap guitars on their records which has resulted in a treasure chest of interesting tone. I also like the visual design of these guitars. 3. What are the good and bad aspects of your guitars? - My Airline is only playable as a slide guitar and only in certain tunings (open D and G6) due to the neck. But it works perfectly for slide which is good enough for me. The Silvertone only works with heavy strings (0.15-0.56) due to the short scale. I mostly tune it in open E. This works on the solidbody models, the older particle-board bodys wouldn't hold up to these strings and this tuning. The heavier the strings, the bigger and better the tone for slide. 4. Do you use your Harmony (or Valco/Danelectro) for gigs or in the studio? - I use the Airline and Silvertone all the time for both purposes. 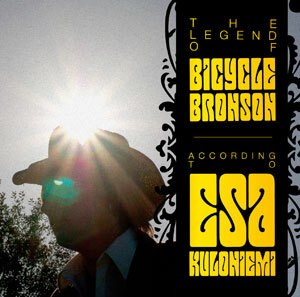 You'll hear a lot of both guitars on my solo-album "The Legend of Bicycle Bronson" (Bluelight Records). 5. Which amps do you use?? - I usually choose from a variety of amps depending on the size and type of venue. My main live amp is a Matchless Lightnin' 15 that I bought a couple of years ago. In the studio and for smaller gigs I use a 1957 (I think) Gibson GA-20T, a finnish Cream Sound and/or a Fender Pro Junior. They are all small amps, but the A-class Matchless is pretty loud if needed. 6. Any fun stories about your guitars….? - Many people have told me how ugly they think the Silvertone is. They think it's been made during wood shop lessons at school or something. On the other hand, everybody says it sounds great. Lately I've been getting a bit pissed off at the White Stripes comparisons when I play my Airline. Jack White was only listening to lullabies when I bought that guitar.